Combine minced anchovy fillets, fresh lemon juice, Dijon mustard and minced garlic in small bowl. Gradually whisk in 1/2 cup olive oil. 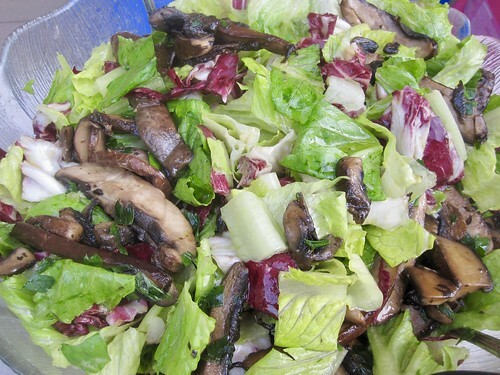 Combine romaine lettuce and radicchio in large bowl. Heat remaining 3 tablespoons oil in heavy large skillet over medium heat. Add flattened garlic to skillet and cook until brown, about 4 minutes. Discard garlic. Increase heat to medium-high. Add mushrooms and sauté until brown, about 4 minutes per side. Remove from heat. Season mushrooms with salt and pepper. Sprinkle with parsley. Add dressing to salad and toss to coat. Mix in cheese. Season salad to taste with salt and pepper. Divide salad among plates. Top with mushrooms and serve immediately.